Blurb is a Verb: How do Teens Read? I tell people all the time just how excellent the Random House Author Portal is, and how valuable their author communications are. They've done it again. 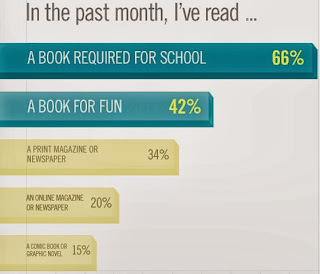 Check out this fabulous infographic on the subject of How Teens Read. The data comes from a Nielsen survey of 1000 teens aged 13 to 17 years. Below is a tiny taste of the data. But be sure to check out the whole thing at RH's website.